What to Do with... Fear of Rejection? "...to wake me up and get going, rather than retreat." So says Sylvester Stallone, that famous Hollywood bugle player! And I believe this rejection fear - one of the most common fears, by the way - is almost like a fear of life, itself. ...How about you? What are your thoughts on rejection fear? Contact us and share your views. Okay, my first encounter with rejection fear comes from my experience of approaching women, women I do not know. So many thoughts spinning around my head, as I contemplate what (if you think about it) is the simple act of approaching another human being and engaging with them. You know, like you did as if it were nothing when you were a child. And all in the vain (and false) hope that the thinking will bring 'protection' - a protection from life, no less! But, perhaps the worst thing about fear of rejection is quite often you focus so much time on this deepest fear that it quite literally stops you from doing; e.g. In short, rejection fear stops you 'asking' for anything. So you can see why one of the most common fears is, at best, a hindrance to all of us - at least the way that we currently allow rejection fear to limit our lives. Okay let's look at what really happens when you get rejected! In fact, I actually think that 'rejection' is frightening because we don't face up to our deepest fear enough. Maybe we should all expose ourselves to that feeling of 'rejection' once a week so that we become blasé (and bored) of the fear of rejection. I'm sure the experiences would prove instructional - "Hmm, I wonder why I got rejected this time?" - and this fear would soon stop being one our top 10 fears. Truth is - whether you experience the kind of fear of rejection I'm talking about, or you experience it in another form in your life - the only thing we have to fear, really, is our fearful thinking and how we might respond to it. Obviously, nobody wants to get rejected all of the time - and I'm not advocating that, either. No, with rejection comes a new insight that can be turned into growth and into success. So, with rejection comes growth. With rejection comes humility. And with rejection comes opportunity. So, really, when we fear rejection, we're actually fearing change. And when we fear change, we fear life! So fear of rejection is fear of life! And, hey, nobody wants to be frightened of life, do they? So I say accept rejection - face up to it, get comfortable with it, learn from it (and forget overcoming fear of rejection) - and accept life. So 'stuff' happens. And with our fears of rejection, commitment, intimacy, success, failure we try to limit and control the impact of this 'stuff' - but we shouldn't. Instead, we should all embrace life - the ups and downs, because that's what life is. Isn't it? conquer the fear of rejection, but help you to appreciate rejection itself." Yes, next time I'll just get Bo Bennett to have his say. It will save us all a lot of time, eh! NOTE: one solution worth considering - is a self-hypnosis download from HypnosisDownloads.com. 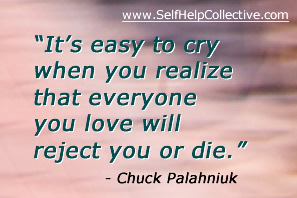 'Overcome Fear of Rejection' is a short MP3 hypnosis script all about this rejection fear. Just sit down, listen, absorb... That's all it takes to make a difference! Share this fear of rejection page - thanks!